Bond appetite eased in reaction to the unexpectedly strong growth components in the June ISM report, which also showed the prices paid index rose to an almost three-decade high, fanning fears of inflation that erode bond values. “It’s negative for bonds and pro stocks. It paints a slow growth scenario with rising inflation. That’s a tough path for the Fed to traverse,” said George Adell, fixed income strategist at Commerce Capital Markets in Jupiter, Florida. Even the original ISM press release overstated the economic case, as the recession had already begun but misreading economic accounts especially in isolation kept alive the idea that the worst of 2008 would be just a slowdown no matter how many markets and banks failed. Economic activity in the manufacturing sector expanded in June following four months of contraction, while the overall economy grew for the 80th consecutive month, say the nation’s supply executives in the latest Manufacturing ISM Report On Business. Even the Markit Manufacturing PMI, which has been noticeably higher than the ISM for the past year, has come back down into suggesting not just this “manufacturing recession” but that it is still far from over or yet at its worst. U.S. factories are reporting the worst business conditions for over three years. 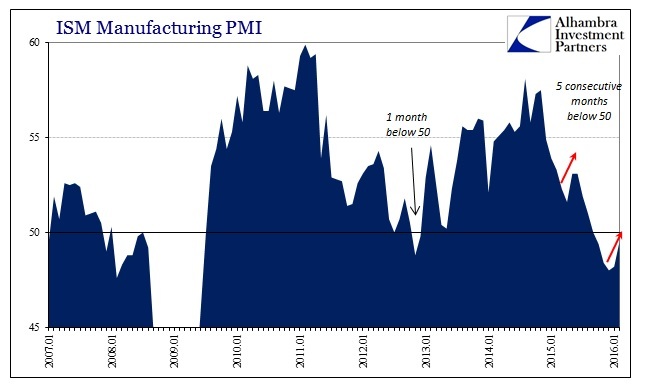 Every indicator from the flash PMI survey, from output, order books and exports to employment, inventories and prices, is flashing a warning light about the health of the manufacturing economy. World manufacturing sector growth stagnated in February as falling prices failed to stimulate new orders, pushing factories to trim workforces, and dealing a blow to policymakers who are struggling to stimulate their economies. “If you were looking for evidence of manufacturing growth stabilising then this isn’t it. There were a couple of low spots that are quite surprising,” said Philip Shaw at Investec. The point of these PMI’s is not whether above 50 or below 50, such precision is fallacy, rather it is that the world economy overall and local networks within it (such as the US and US consumers) are clearly under imbalanced conditions that present very real dangers. Whether or not that means recession is beside the point right now, as official declarations are a post hoc matter for historians. Imbalance is nasty business; to see it globally and in such a heavy and uniform way under rather and relatively benign conditions is quite alarming. Around the world there are as yet any systems expressing major job losses and still global manufacturing recession is suggested.